Home Depot (NYSE:HD) and Target (NYSE:TGT) are two of the most prominent retail chains across the American landscape. Both companies have defined the "big-box" category of stores that have popped up in strip malls across the country over the last generation, changing the way Americans shop. The similarities don't end there. Both companies have approximately 2,000 stores in the U.S. and have been more successful than many of their retail rivals in fending off the threat of e-commerce as each company has delivered strong growth in recent quarters. However, the performances of each stock has diverged over the last five years, as the chart below shows. 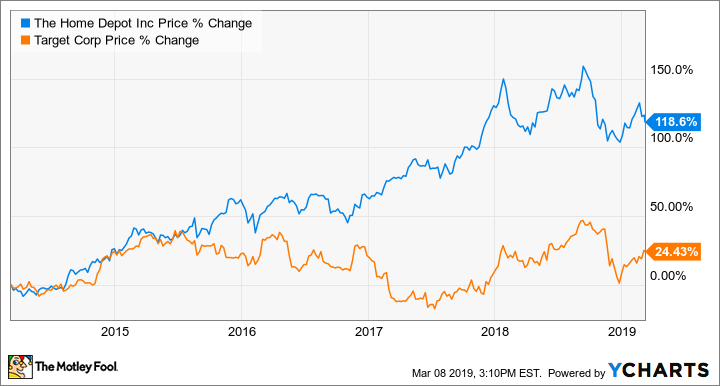 Though both stocks have essentially traded flat over the last year, Home Depot is the winner over the longer term, as it's benefited from an expanding housing market as well as its standing in a home-improvement retail duopoly that's been well protected from the threat of e-commerce. However, Target has been making a number of smart moves lately and his fresh off a strong holiday quarter. Which is the better buy today? Let's take a closer look at what each stock has to offer before we render a verdict. Home Depot has been one of the best-performing retail stocks over the last decade, jumping 900% as it has capitalized on a strong housing recovery. More recently, however, skepticism seems to be building for the company's future growth as the housing market is cooling off. Nonetheless, the company delivered comparable sales growth of 3.2% in the fourth quarter, and 3.7% in the U.S., which may be slower than investors may be used to but is still a respectable clip for a retailer in today's environment. Unlike other retailers, including rival Lowe's, Home Depot has largely refrained from opening stores over the last decade, instead investing in store improvements, e-commerce, and share buybacks. As a result, profits have generally grown faster than sales, and earnings-per-share growth was particularly helped by the tax cut this year as EPS jumped 33.5% to $9.73. Shares outstanding also fell 3.5% in the period from a year ago. For the year ahead, the company sees comparable sales growth of 5%, but EPS growth of just 3.1% to $10.03, getting a slight headwind from losing a week in the fiscal year. That EPS guidance includes an estimated $5 billion share buybacks. Management also said it expects a flat operating margin for the year and a slightly higher tax rate. Though that EPS guidance could be overly conservative, for investors it means that without beating its guidance significantly, the stock is likely to trade flat this year. Check out the latest earnings call transcripts for Home Depot and Target. Target, meanwhile, is coming off its best holiday quarter in years with comparable sales up 5.3% on traffic growth of 4.5%. The company made a number of efforts to improve performance over the holiday season, including providing free two-day shipping with the help of Shipt and remodeling its toy department in hundreds of stores, and those efforts appear to be paying off. Target said online sales rose 31%, comparable store sales increased 2.9%, and the company gained market share in all five of its core merchandise categories. The big-box chain has a unique profile in the retail world with its "cheap chic" image and wide range of merchandise, including food and beverage, home and apparel, and the company is leveraging that to its advantage as it invests in e-commerce services by using its store base to support quick delivery and in-store pickup. Management said stores fulfilled nearly 75% of online sales in the fourth quarter. Regarding the company's real estate strategy, Target has essentially stopped opening large-format stores and is instead focusing on small-footprint locations, under 50,000 square feet, in places like college towns and underserved neighborhoods in cities. The number of those stores increased from 48 to 71 in the past year, and they should attract customers looking for convenience and impulse buys, as well as support the e-commerce business by providing points for convenient pickup and fast delivery. Finally, Target signaled that momentum from 2018 would continue into this year, forecasting comparable sales growth in the low-to-mid single digits and adjusted earnings per share of $5.75-$6.05, up from $5.39 last year, representing about 10% growth. With both companies coming off solid holiday quarters, Target seems to have the edge in earnings growth for the coming year, while Home Depot projects slightly better comparable sales growth. On dividend yields, it's close to a wash, too, as Home Depot offers investors a 3% yield, fresh off a 32% hike in its dividend payout, while Target pays a 3.3% yield. However, Target seems to be the clear winner on valuation as the stock trades at a P/E of 14.1, compared to Home Depot's at 18.6. Target is even cheaper on a forward basis given its faster projected earnings growth this year. In addition, Target doesn't face the risk of a housing slowdown as Home Depot does, which means Target would probably fare better in a recession should one hit as some investors fear. Both stocks are strong enough that they should outperform the broader retail sector, but given its price, faster earnings growth, and better defensive position, Target looks like the better buy today.